Notice I didn't say display your Christmas ornaments. Halloween ornaments and Valentine ornaments have become very popular in recent years. But very few of us have Halloween trees or Valentine trees. 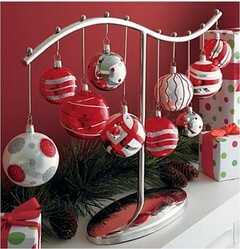 So an ornaments tree or ornaments display stand is a great way to show ornaments off all year. Ornaments trees generally look like trees, either natural or metal. The newest trend is to have a ornament display stand that may or may not look like a tree. Many ornament display stands actually hold a single ornament. If you've got a older relative or neighbor who had to move into an assisted living facility or nursing home, they probably can't have a full-size Christmas tree. But with an ornaments tree they can still enjoy their favorite ornaments and the memories they bring back.They can even have some of the fun of decorating for the holidays. You could get a tree-shaped ornaments tree and a small Christmas tree skirt. Don't just think of an ornaments tree as a Christmas tree to put on a side table near the main Christmas tree. I love to use one as a centerpiece for my Christmas morning brunch. The year I was married, everyone in the family gave me a personalized Christmas ornament containing a photo of our wedding reception. The photos aren't of my husband and me, but of people who were at the reception. (Yes, there was a little family conspiracy in this gift.) So everyone loves to check out the ornaments on the ornament display stand. I got soooo many ornaments, that the display changes every year. I am proud to have Christmas ornaments that have been in my family for generations. I also have two little black cats named Busy Body and Chaos who usually live up to their names. Their Christmas mission is usually to try to destroy every ornament on the Christmas tree. So I would never think of putting these family keepsakes on the Christmas tree. I also want everyone to enjoy these and remember the women who displayed them before me. So I have individual ornament trees for each one. 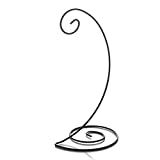 10 Spiral Ornament Display Stand - Black "
Whenever I can, I put a picture of the woman who owned the ornament beside it with a brief bio of who she was in our family. That way these ornaments become a living scrapbook of our family tree. The smallest children start to know the women who kept the family home and business running while their husbands where out hunting for whales for years at a time. Luckily we have some uncles who are great storytellers. And every Christmas morning while we gather to celebrate, they regale us in stories of our ancestors. Sometimes I picture the littlest of our family, all grown remembering the Christmas mornings at Aunt Digby's house. More Christmas Decor and Decorations to Adore! Create a dazzling Christmas tree with the help of these Santa tree skirts. Bright and fun and selling at low prices. A very practical idea. With small kids around I only put unbreakable ornaments on the actual tree. Besides a very practical idea I love how you can remember your family tree :) Makes me wish I had ornaments passed down from generations, sadly enough they mostly come from the shops in my case. What a lovely Christmas tradition to pay tribute to your ancestors, a great way to bring history alive.